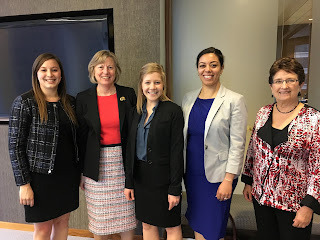 Humphrey School of Public Affairs graduate students Alexandra Sevett (MPP ’17), Lauren Walker Bloem (MPP ’17), and Maram Falk (MPA ’17) presented their final capstone graduate research project on Wednesday, May 10th on the topic of global efforts to stop violence against women. Their study focused on evaluating the existing international mechanisms that address this issue and the current political climate to determine the need for and feasibility of a new global treaty specifically combating violence against women. The work was commissioned by Global Rights for Women (GRW), a Minneapolis-based nongovernment organization that works across the world promoting women’s human rights and pursues reform to effectively combat violence against women and girls. The semester-long study concluded with a final presentation at the GRW offices in downtown Minneapolis and a report that outlined a recommendation for the global community to pursue a global treaty. The capstone group made additional recommendations specifically for GRW that would help build on this global effort. For more information about GRW and their work, please visit their website at http://globalrightsforwomen.org/.